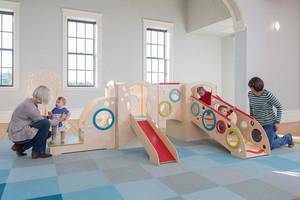 Rockport, Maine, March 8, 2019 /PRNewswire/ -- CedarWorks has recently launched a new line of indoor play systems designed to meet commercial safety standards for children ages 6 to 23 months. The new Under2 indoor line of play features the same beautiful design sense and quality materials as CedarWorks residential and 2&Over commercial indoor playsets but Under2 is designed especially to meet the safety and developmental needs of very young children featuring lower play decks, smaller slides and ramps, and play features that appeal to infants and toddler including mirrors and windows to peek through. Under2 playsets also feature modular designs, so they can be constructed to fit anywhere from a corner of a play area or the middle of a large, dedicated play space. As with all CedarWorks products, Under2 playsets are made from environmentally and kid-friendly materials. "We just launched a line of commercial indoor playsets designed for children over 2 years old last year. We were surprised by how many of our customers told us they were also looking for playsets geared toward even younger kids," explains Eric Winters, CedarWorks Commercial Sales Marketing Specialist. "We decided to design a fun playset to meet the needs of our youngest customers, and we ended up with a whole new product line. CedarWorks designs and manufactures the highest quality, most beautiful play systems in the world, working directly with families and businesses to custom configure outdoor playsets and playhouses, indoor playsets, furniture and toys to match each customer's needs. The new Under2 line is available for shipping this spring. Visit https://www.cedarworks.com/commercial for more information and to see example playsets.